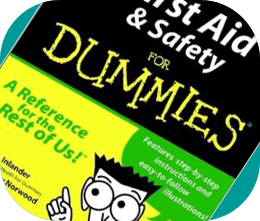 First aid saves lives, but how important is it to learn basic first aid skills? First aid is not about dummies but more about feeling confident about carrying out life-saving first aid and supporting the environment you work and live in. In the workplace the Health and Safety Executive (HSE) report a significant decline in work related injuries over the last decade but unfortunately accidents still happen. Up to 150,000 people a year could be dying unnecessarily because first aid is not widely enough known and the skills are not being taught to employees on a regular basis. Mother and baby magazine have just published some frightening statistics. According to a recent readers’ survey which canvassed 2,000 parents, 90% of respondents admit to being ignorant of the most basic first aid guidelines. This is extremely alarming when you look at the numbers of accidents that take place at home – in excess of half a million toddlers are rushed to accident and emergency each year following accidents in the house – with an average of 76 under 4s dying as a result. First Aid training is a very diverse subject and the training a person receives should be based on the environment they work in. For example, a child minder would benefit from a Paediatric first aid course which will focus on an infant or child casualty. A worker in the construction or building sector should attend the 3 Day First Aid at Work training as recommended by the Health and Safety Executive (HSE). Any employer should be able to identify their first aid requirements by carrying out a ‘risk assessment’ within their business and there are many factors that will determine the outcome such as number of employees, how many buildings are in situation, the work patterns of your staff, specific risk indicators etc. Just because a business is classed as a ‘low risk’ environment, this will not exclude it from delivering first aid training – again the requirement will be determined by carrying out their risk assessment. Since 1 October 2013 HSE no longer approves first aid training and qualifications – and no longer approves first aid training organisations. This means that it is the employer’s duty to ensure that any training provider that they select for the purposes of first aid training is competent to deliver that training. As a training provider we do still see ‘training providers’ offering training to ‘HSE accreditation’ and gives us rise for concern as the courses offered may not be Ofqual regulated. An accredited First Aid training course is a regulated and nationally recognised qualification designed for those who have a responsibility to provide first aid. Regulated qualifications are nationally recognised and can be obtained from a training centre for an ‘awarding organisation’ (AO). These AOs are recognised by qualification regulators (Ofqual, SQA or the Welsh Government). Ofqual is the regulator of qualifications, examinations and assessments in England. SQA (the Scottish Qualifications Authority) and the Welsh Government carry out similar functions in Scotland and Wales. Before you book your first aid course request which ‘awarding organisation’ the training provider will be delivering the training under. Feeling confident about carrying out life-saving first aid treatments, and actually having the ability to do so are different things entirely. And doing the wrong thing could actually make matters worse. Knowledge of first aid promotes a healthy, secure and a safer environment, and builds confidence amongst people, their families, their colleagues and associates. Basic first aid knowledge is very helpful in dealing with trauma situations. Not just the medical help they provide, but the confidence they exhibit is very helpful during casualties. Being trained to provide first aid is useful to oneself and the environment you work and live in.